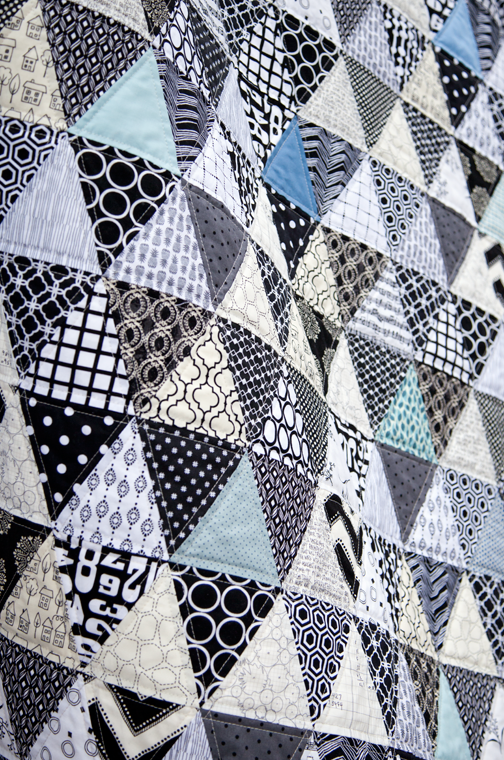 It was a week of marathon sewing and quilting to complete this black and white triangle quilt before I left for my Easter travels. When I first started, I didn't know how I was going to feel about all that black and white so I decided to add in some blue. You can read my previous post about this quilt here. I am so thrilled with the results and for a person who is so much about color, I think this is one of my favorite quilts to date. 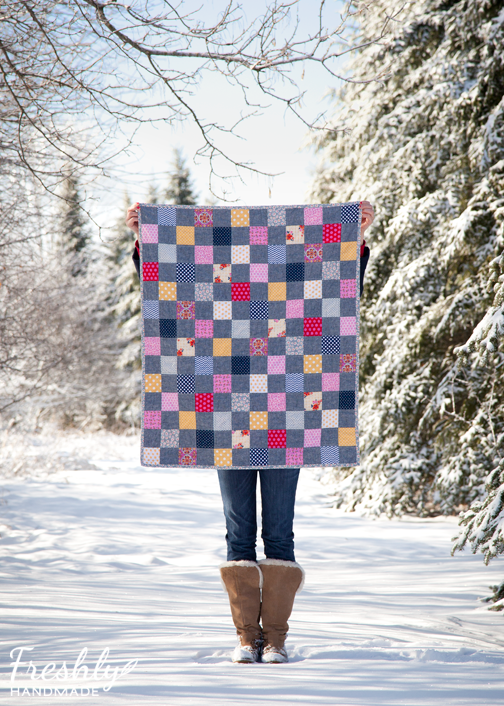 I was hoping that I would not have to photograph anymore quilts in the snow this season, but that ended up not to be the case. Fortunately, I can report that the snow is now all gone. 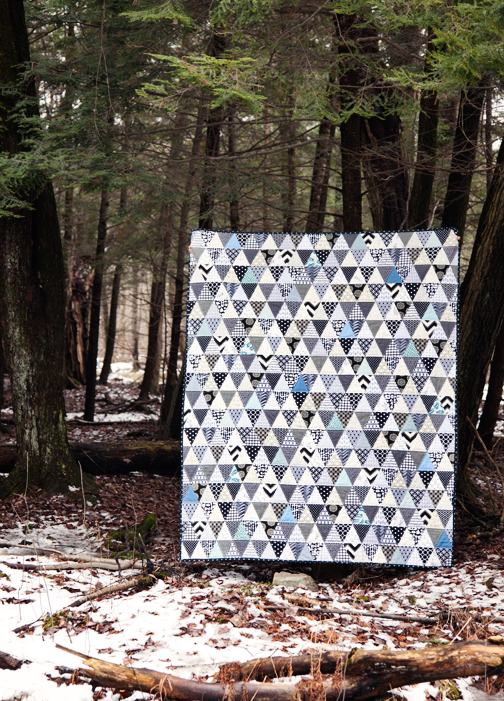 I used 15 different white prints, 15 different black prints and 8 different blue solids and prints to make up this quilt. Each triangle measures 4" and the overall size of the quilt is 60" x 72". I quilted it with straight lines on both sides of the horizontal and diagonal seams. 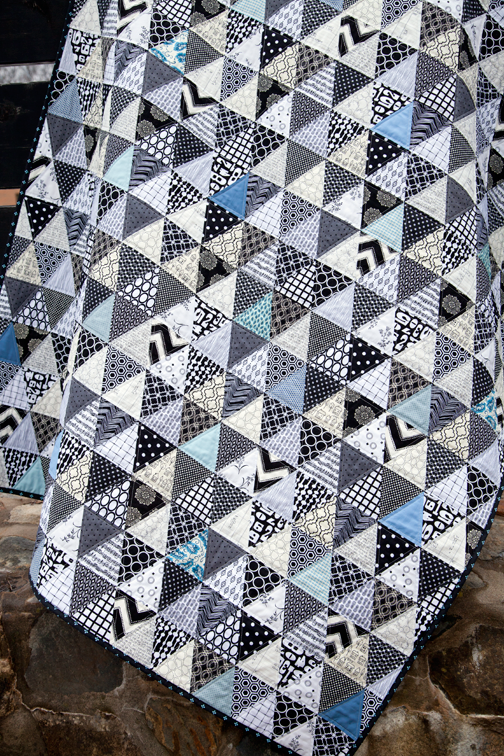 For the back, I used a black and white houndstooth flannel which gave the quilt a nice weight and softness. I love that I was able to find a black and blue binding to coordinate with the touch of blue in the top. I have a ton of clean up to do after last week, plus I am still trying to kick my sickness so I may be needing a tiny break to get things in order again. 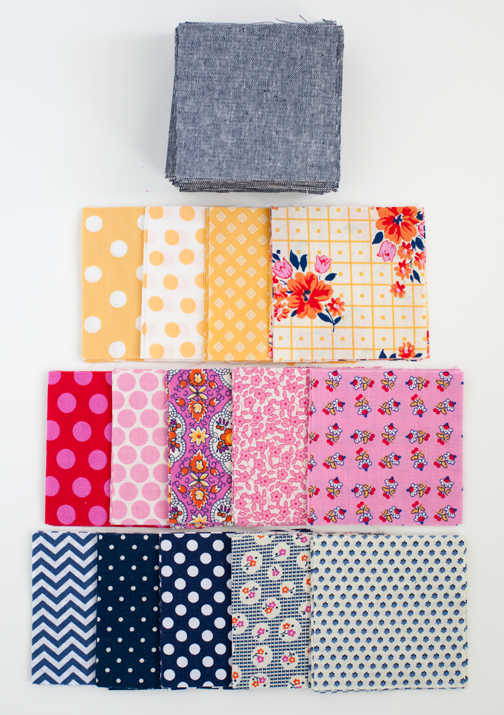 Sometimes I can't resist cutting into a stack of fabric, especially if I know it will be a somewhat quick project. That's my justification for not waiting. It'll be quick so I can push the other projects (or housework) aside. That's how I was with this patchwork quilt I just finished. 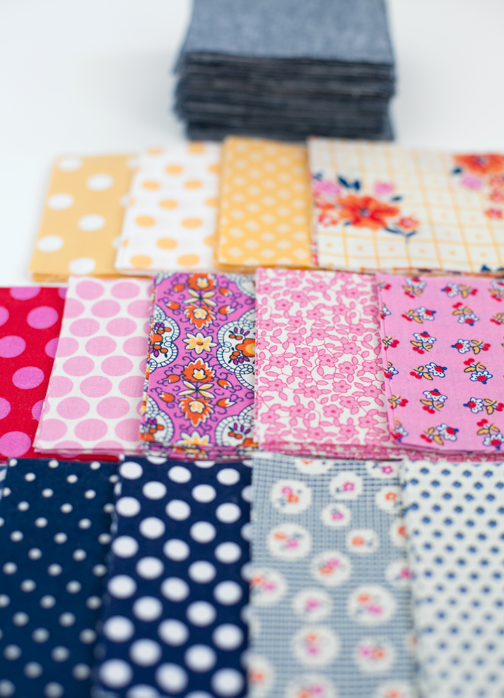 You can read my previous post here and get a closer look at the fabric selection as well. 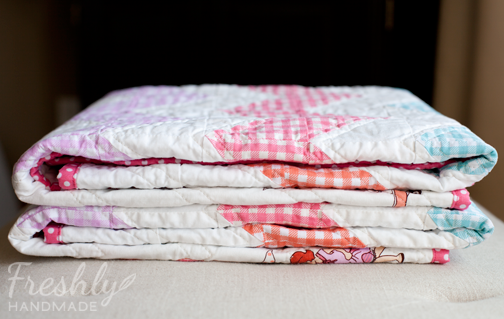 I love how this little quilt turned out. It's simple, pretty, traditional and modern at the same time -- just my style. I took these pictures this weekend and yes, we still were getting snow and sleet. 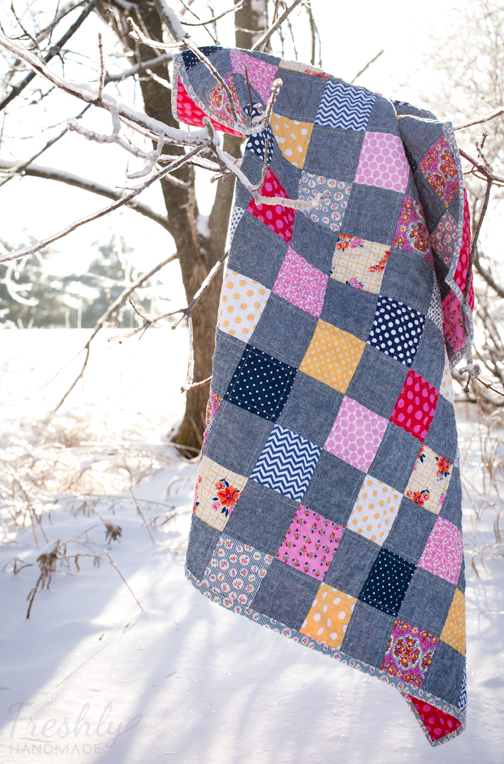 However, I am hoping this will be the last time I'm photographing a quilt in the snow until next winter. Anyway, I was pleasantly surprised at how all the colors worked together as a whole. I had a bit of skepticism at the beginning, but once I started arranging the blocks, I was like, "Ooo...I like this!" 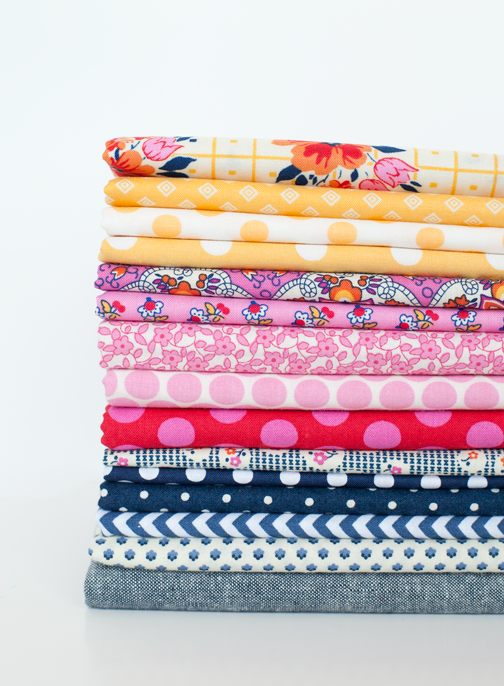 This quilt has a bit of everything -- both bold and classic prints and colors, as well as texture and a natural feel with the yarn dyed linen. I quilted it with straight lines on both sides of the vertical and horizontal seams using natural colored thread on the top. You can see it's been washed and dried to give it a bit of crinkle. 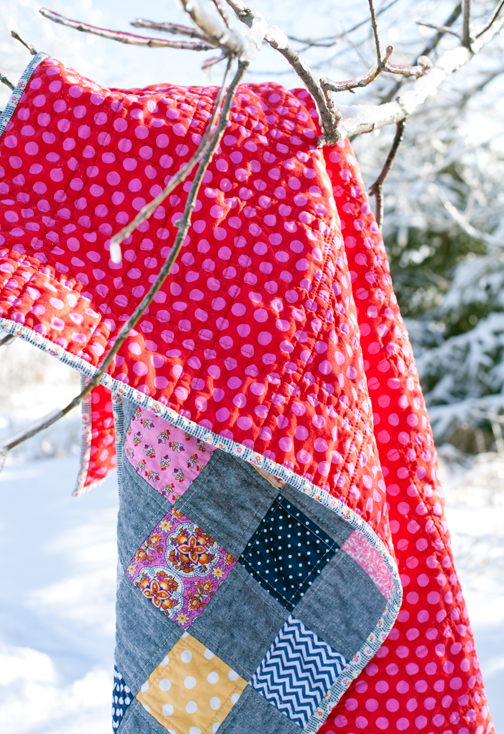 For the backing, I used a bright and bold red and pink polka dot print from the Piccadilly line from DS Quilts. 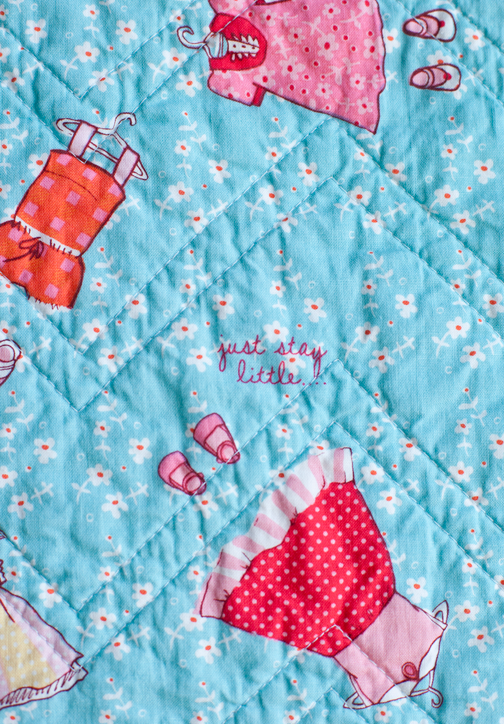 This sweet quilt is for sale in my Etsy shop and would be a lovely gift for a little girl. 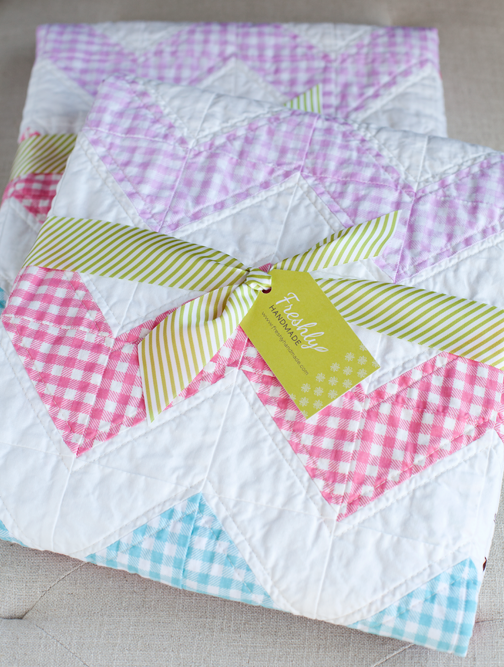 To visit my shop and the listing for this quilt, click the links below. 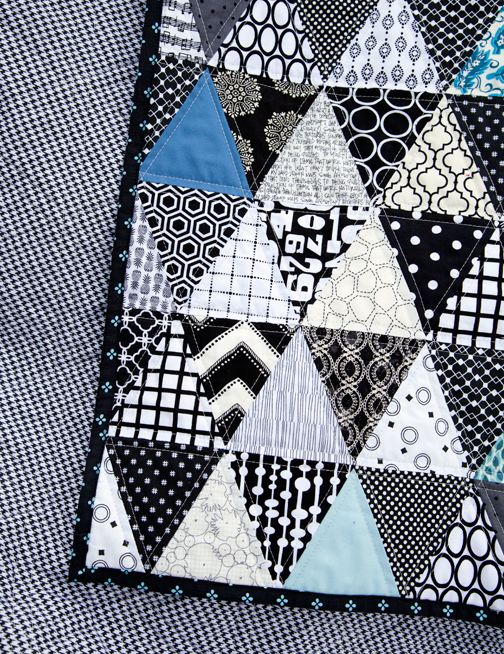 I'm excited to start piecing together the black and white triangle quilt that I posted about here. I promised myself not to start any other random projects until that one is done. One of my favorite fabric designers is Denyse Schmidt. I mean, she's an icon. 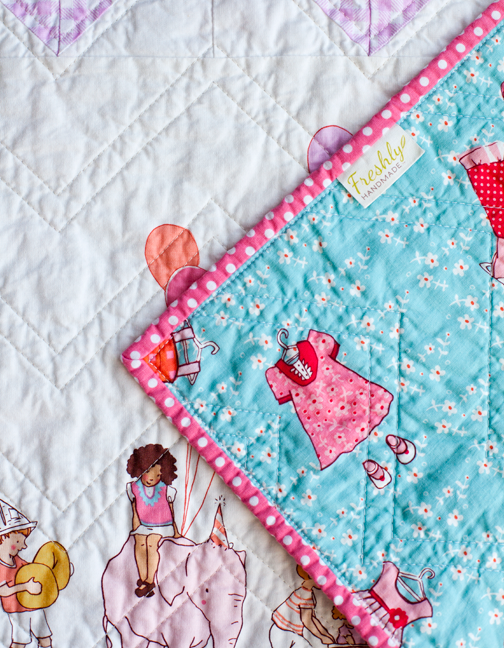 Her fabrics are available through quilt shops across the world, but her DS Quilt fabrics are also available at JoAnn stores. I make my fair share of stops at JoAnn's on any given week (too many! 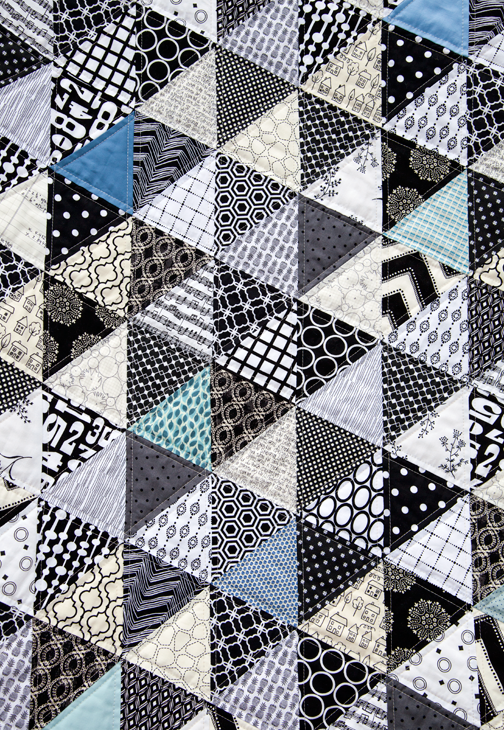 ), but it's always a fun day when I've discovered new DS Quilt fabrics have been released. Recently, I picked up a small bundle of new prints from the Piccadilly line. The prints from this line are bold. The pink is bright. I ended up initially choosing some of the more subtle prints. I got them home and wondered what the heck I was going to do with them. They don't match a lot of my stash, but then I started digging and found my Essex yarn dyed linen blend fabric in Indigo and thought it would be the perfect complement to these prints. 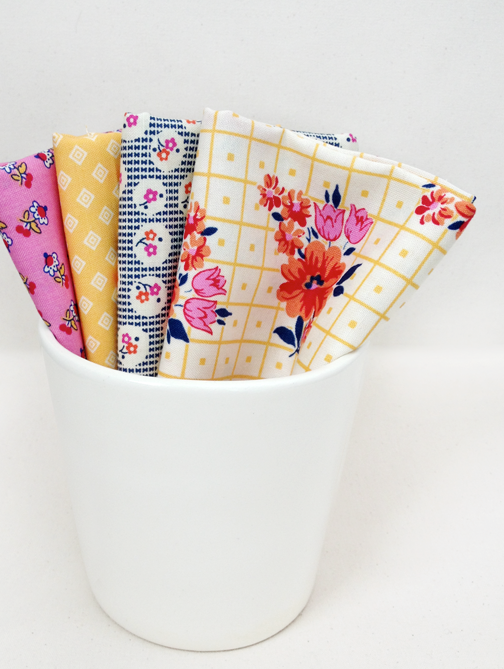 I continued to rummage through my stash and found some other complementary prints in yellow, pink and navy. 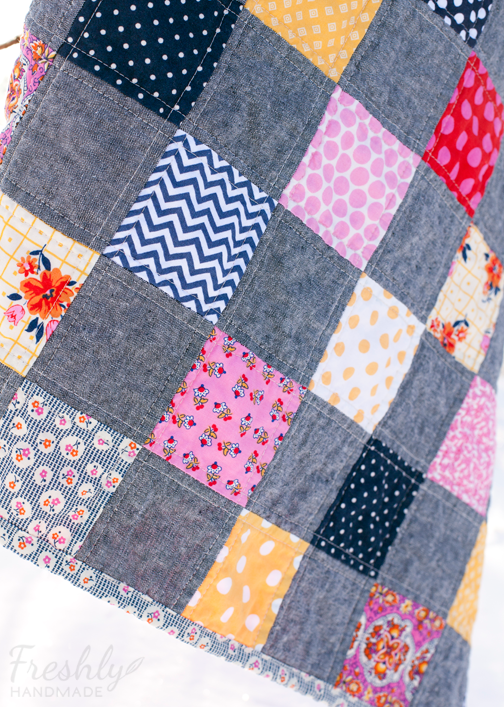 I wanted a quick project so I decided to start a basic square patchwork quilt. I told you I've been bouncing around lately and starting more projects than I should, but I just couldn't resist on this one. More to come soon! 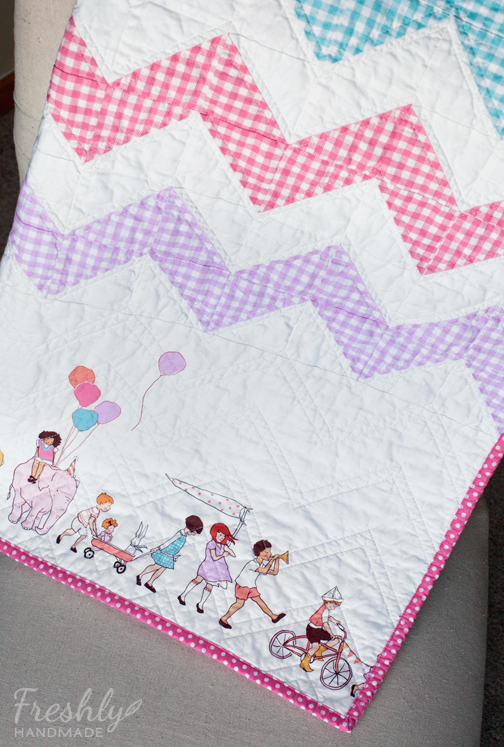 I had the pleasure of making two more Children at Play chevron quilts for a lovely customer. You can see the full quilt and the original design here. I just love this quilt and I think others have as well with the number of requests I've had to make more. Unfortunately, I don't have the fabric necessary to make more and the fabric line is now out of print. It's sad because I know so many people LOVE the Children at Play line, me included. For these two quilts, the customer had the fabric to supply. Everything is the same as the original, but she had a really cute blue print for the back that worked perfectly. Oh, those sweet girl dresses and fancy shoes -- so cute. And the sentiment, "just stay little", is exactly how I feel about my little lady, but she refuses to stop growing up. It's been fun making a couple more of these quilts. Of course, it's always a good day when I get to work with Sarah Jane fabric too. I sure hope the lucky recipients enjoy them as much as I do. I have a number of different projects in the works right now and I've been bouncing here and there and everywhere lately. It's been a little challenging this week getting anything done with 3 out of 4 of us sick in the house, plus it's spring break. I'm just going to keep plugging away when I can.